Incredulous Tip #24: Do not stir their yogurt. WHY DIDN’T ANYONE TELL ME that when little people teeter upon the precipice of age two, they become, oh I dunno, Jekyll and Hyde…Two Face…Golem with the ring…Golem without the ring…Menopausal-Dorothy-from-Golden-Girls… Why? Why? Why? I suppose knowing wouldn’t have made a difference, even to me – the girl who tries to prepare for (and subsequently control) every situation by researching it to death. It wouldn’t have changed anything, although some manner of preparedness might have been nice. But Chris, everyone KNOWS that toddlers are difficult. It’s no secret that it’s called the “Terrible Twos.” All you had to do was pick up a book, or read any article on the subject. Wellguesswhat, I DID. And you’re a fibber and you’re a fibber and you and you and you [finger pointing here…lots of finger pointing]. And there you have it, folks. The damn truth. See? Was that so hard? So here’s the scoop for realsies. I am loving this stage. My little Bubbalooshki Bear is all of these hideous things. Truly. BUT…he is also able to run and jump now. He can say sentences people. Ok, they’re not much, but I find them impressive. (Run Mommy! Where Daddy go? Chloe potty outside!) He tells me when he has to poop (after he’s done it, and while refusing to sit on the potty). He eats just about whatever you give him. He gives the most scrumptious, warm, fuzzy huggies and kissies you’ve ever had the pleasure of receiving, and his laugh is the most righteous example of what the world needs to hear every day while commuting to work. I love that kid. I love him I love him I love him. I’m a love-struck idiot for a guy who’s sadistic mind games, peppered with moments of sheer joy and meaningful giggles, keep me coming back for more rides on his wacky-fun-house-tilt-a-whirl. I love him for laughing unfailingly when I tickle his armpits or smell his feet. I love him for the serious effort he puts into mowing the yard with his bubble-mower. I love him for helping me pick up weeds one at a time, and for doing the worst job of wiping your own nose that anyone could ever do. I love him for the way he runs to me when I pick him up from daycare, the day’s accumulation of boogers crusted solid beneath the nose that rests just above his tiny lip, which is mottled with the fuzzy blond hairs that make up his little Lorax ‘stache. 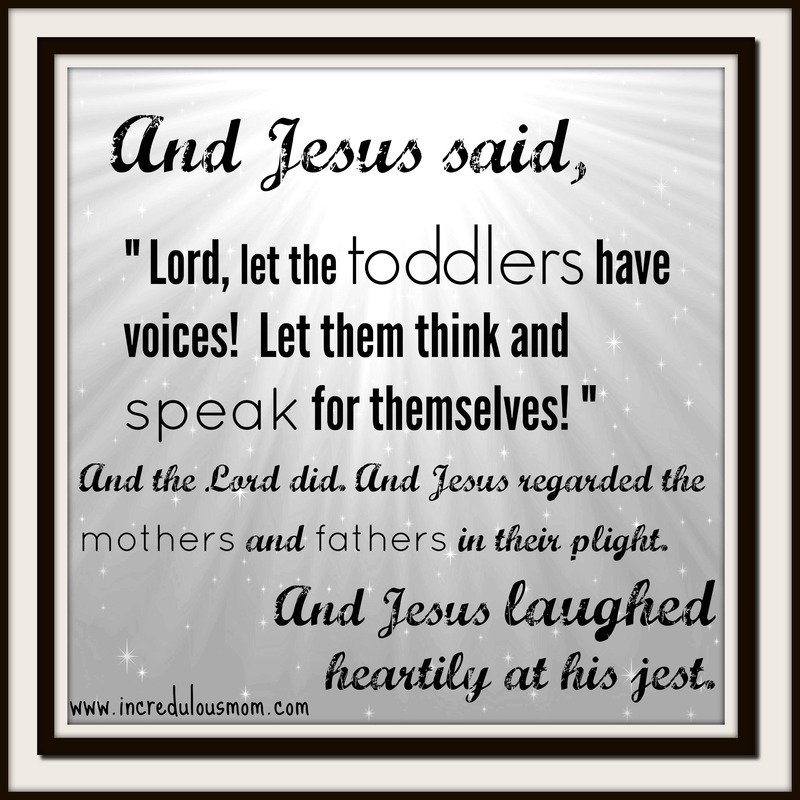 “Toddler” is not a state of being, it’s a condition – a bestial, repulsive condition that is simultaneously wonderful, and magical, and hilarious, with the ability to make you grateful for every failure because of the ensuing triumph that is sure to follow. Mom: I can do anything she can do worser. OMG! Exclusive first pics of Eva Mendes and Ryan Gosling’s BABY!